Dark Gnome – Sign up for the pixel game for free! Dark Gnome – The battle of the dwarves begins! Kazrik and Thungni put up a good fight. But Norgrim goes down in the second round. The armored rat deals out a mighty blow to his noggin. The wiry dwarf stumbles backwards and immediately disappears in a flash. But there’s not much time to mourn the fallen dwarf. The battle goes on. 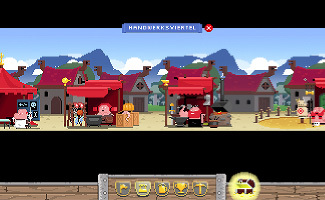 In the pixel game Dark Gnome you become the hero of the dwarves. As soon as you take office as the ruler of the village, the wise sage Flemming gives you your great mission: liberate the dwarves and banish the mean rat king Charles. Spirited and courageous, you start building your own dwarven army. Discover this fascinating pixel art game. Play now! Are you ready to take responsibility and lead the people of the dwarves to freedom after centuries of oppression? Assume the role of the dwarven village’s ruler and prepare for your secret mission. The jerky rat king Charles needs to be banished. Be careful and plan strategically. Recruit a dwarven military unit in the pixel game Dark Gnome. Go on rescue missions, free prisoners, collect items, open treasure chests and prepare for your great battle against rat king Charles. 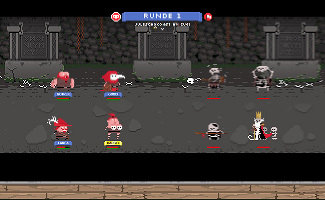 Discover this riveting RPG with its funny pixel graphics. Sign up now and get started! Your troops used to be in better shape. In the battle against the rat elites, your dwarves received quite a number of cuts and bruises. Using the last of your strength, you drag yourself to the village doctor. Your encounter with this extraordinary physician is giving your wounded heroes an immediate adrenaline boost. Instead of academic merits, the self-proclaimed bone healer only has a butcher apprenticeship to show for himself. He said he was bored, that’s why he switched from butchering to sewing things up. The butcher, or village doctor, respectively, is but one of numerous hilarious characters you meet in this enchanting adventure pixel game Dark Gnome. Is that how you treat a hero who takes a stand for the dwarven fate? “Please give me some space, you smell.” is what the merchant in the tavern whispered in your direction. An impudent fellow, that one. For a moment, you seriously consider splitting open that well-nourished dwarven capitalist’s head with either a loaf of pumpkin bread, or better yet, your stone sword, but then you only have eyes for Barb. She’s a reeal heroine, wearing a fashionable skull bra who always preferred playing with axes instead of puppets growing up. And guess what: she’s available! What a lady! 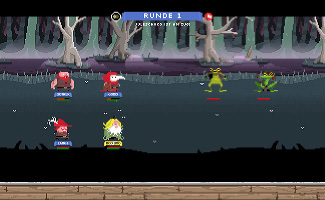 Discover the delightfully crazy pixel game Dark Gnome. Dark Gnome - Discover, explore, conquer! 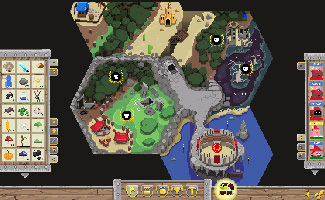 Plunge into a fascinating pixel art world and become the savior of the dwarves!